We have been dealing with the application of LED technology in obstruction and hazard lights since more than a decade. Our product portfolio also includes control cabinet development and manufacture as well as smart control technology such as the proControl series. proControl facilitates full access to the monitoring and control of the entire flight lighting from a distance, whereby a detailed diagnosis of the systems can already take place before our service teams are deployed for you. All flashing lights have GPS and dusk sensors on board – they only need a buffered 24 VDC-voltage supply and do their job. 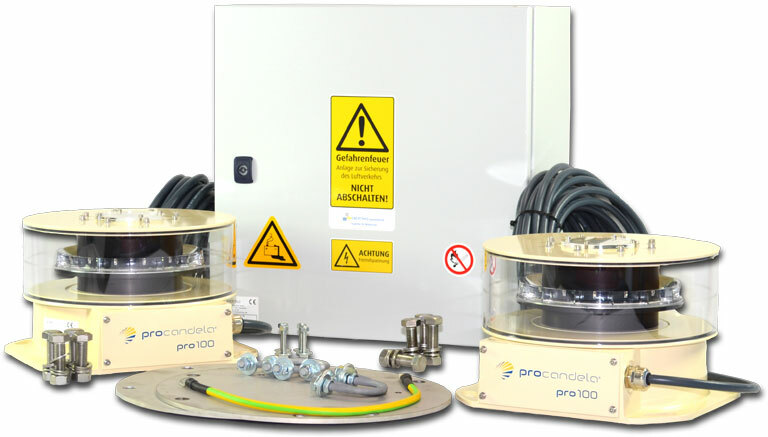 Our portfolio is rounded off by obstruction lights from the procandela series that are available in diverse variations with different light strengths and also with infrared lighting.